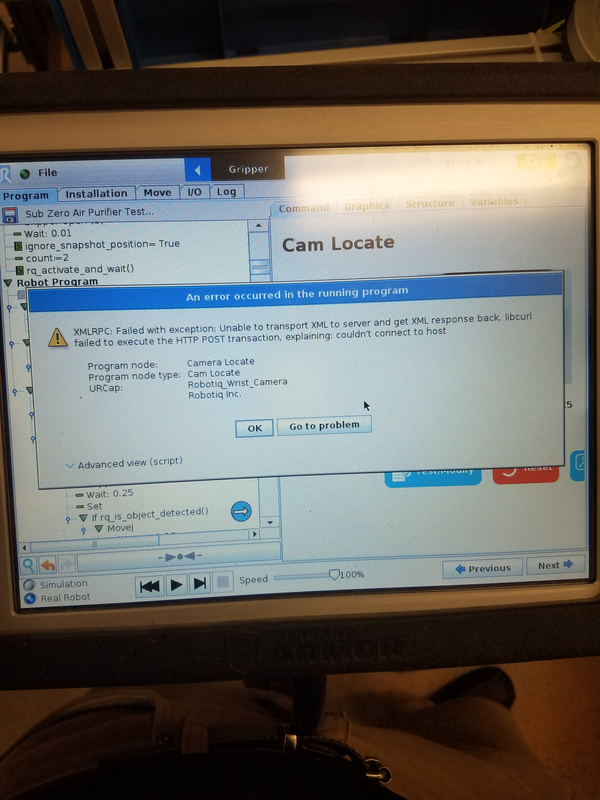 Robotiq Wrist Camera Issues - XMLRPC: Failed with exception: Unable to transport SML to server and.. I am using my Robotiq wrist camera for a pick and place application. I am using a CB3 UR5 with the CB Camera and CB 2F-85 Gripper. I am running Polyscope 3.7.2, UCC 1.6.5, and UCG 1.5.0. Everything should be the latest version. Intermittently, I will receive the following error (about every 10-40 parts). "XMLRPC: Failed with exception: Unable to transport SML to server and get XML response back. libcurl failed to execute the HTTP POST transaction. explaining: couldn't connect to host"
After clicking, OK, I will have to go to installation and reinstall the vision server. We cannot run with this error reoccurring all the time. Any suggestions? @Mschack, we opened a support ticket to help you with that.